You can sign up for your first free class anytime by visiting our Schedule page. If you would rather meet with us prior to your first class, let us know and we are more than happy to set up a consultation. Schedule a no–obligation consultation TODAY! What kinds of exercises will I be doing? WO1-a-Day Workouts are designed to work every muscle in your body, while mainly focusing on your largest muscles. Which burn the most calories. Common exercises include, bodyweight training, stepping, jump rope, squatting, dumbbell training, some running, band training, core isolation training, kettle bell training, TRX suspension training, some yoga, and stretching. What fitness level is required? Will I fit in? WO1-a-Day Workout classes range from beginners to veterans of exercise. The class has a unique way of challenging the most fit, while at the same time, accommodating beginners. Everyone is encouraged to push themselves only to their personal limits. The environment is completely encouraging and motivating. Should I do Classes or Private Training? Deciding which training is right for you is one of the things that we will discuss in your initial consultation. Your personality, goals, and schedule are a few things we will discuss to determine what the best option is for you. Water is the only thing that you have to bring with you. Wear a good pair of supportive tennis shoes, and comfortable clothing that you can move easily in. The WO1-a-Day Workout is not an easy class! That is why it will give you great results. By challenging your muscles in new ways you will feel soreness during your first week or two. After that, you will likely feel mild soreness from time to time as we work new muscles in new ways, week by week. This is a great feeling that will reassure you that you're doing something great for your body. We recommend about 2–4 classes per week. Be sure you are fueling your body properly and drinking enough water. Our classes are intense, and recovery is essential for your overall health. We do not recommend doing our class every day. Will I be forced to do something uncomfortable? 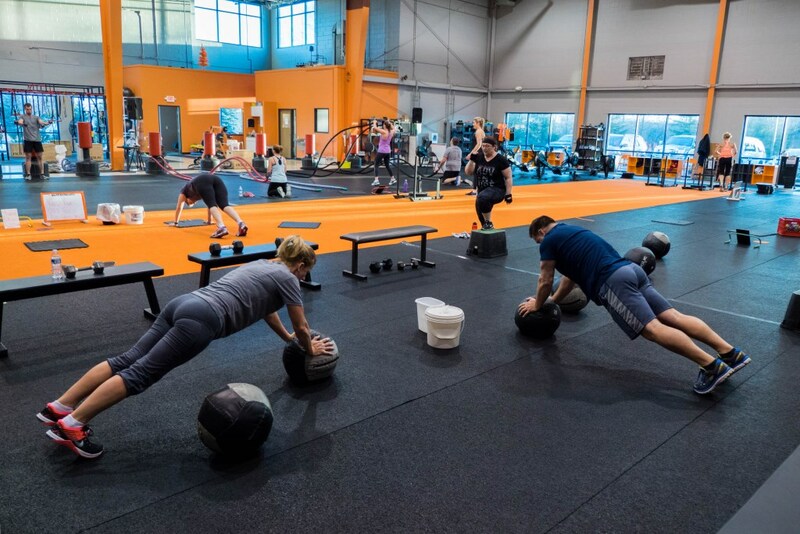 At Workout1, we are proud to accommodate people of all ages, shapes, sizes, fitness levels and injury backgrounds. We strive to make people feel as comfortable as possible, while getting in the best shape of their life. If a particular exercise makes you feel uncomfortable, or goes beyond your current physical capabilities, we will be happy to give you an alternate exercise that will progress you in the safest way possible. Workout1 is on the southeast corner of the intersection of Michigan Ave. and Industrial. The entrance is off of Industrial. Our suite is located at the northeast corner of the building.